This is the most creative Valentine’s Day gift I’ve seen yet. A yellow cake with strawberry filling, covered in vanilla frosting and vanilla-almond fondant. 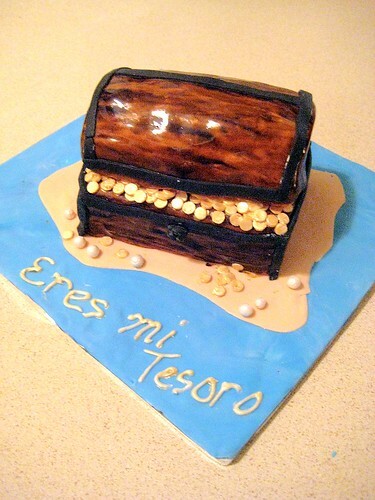 The wording, “Eres mi tesoro” is “you’re my treausre” in Spanish. Very cute and adorable! It’s a good thing it’s a Valentine’s Treasure Chest, and not a Valentine’s Chest…. he he!